This two day conference will address both cutting edge and practical issues in surgical pathology in line with new volumes of the AFIP Fascicles that are appearing in 2018 and 2019. Key topics include salivary and sinonasal lesions, contemporary issues in breast needle biopsies, pathology of lung tumors in the modern era, gastrointestinal and liver pathology, and bone and soft tissue pathology with radiologic correlation. The course will be in both lecture and case -based formats and questions and discussion will be encouraged. This activity is intended for pathologists, nurses, NPs, PAs and pathology residents. A $50 late fee applies to registrations received after 5:00 p.m. ET on March 31, 2019. A handling fee of $50 will be deducted for cancellation. An additional fee may apply for cancellation of other events, including workshops and social activities. Refund requests must be received by fax or mail by March 31, 2019. No refunds will be made thereafter. Transfer of registration to another Johns Hopkins activity in lieu of cancellation is not possible. Increase synergy between radiologic and pathologic evaluation of skeletal lesions. Define diagnostic criteria and molecular underpinnings of lung adenocarcinoma. Recognize and diagnose key gastroesophageal precancerous processes. 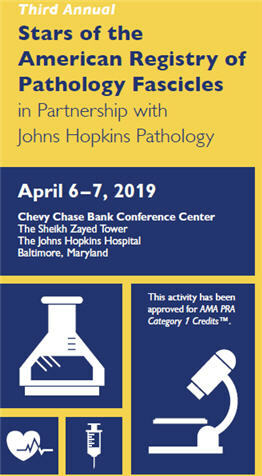 This activity has been planned and implemented in accordance with the accreditation requirements and policies of the Accreditation Council for Continuing Medical Education (ACCME) through the joint providership of Johns Hopkins University School of Medicine and American Registry of Pathology. The Johns Hopkins University School of Medicine is accredited by the ACCME to provide continuing medical education for physicians. The Johns Hopkins University School of Medicine designates this live activity for a maximum of 15.25 AMA PRA Category 1 Credits™. Physicians should claim only the credit commensurate with the extent of their participation in the activity. This course is approved for self assessment module (SAM) credit by the American Board of Pathology and addresses the ACGME competencies of Medical Knowledge and Systems-Based Practice. The Johns Hopkins University has approved this activity for 15.25 contact hours for non-physicians.